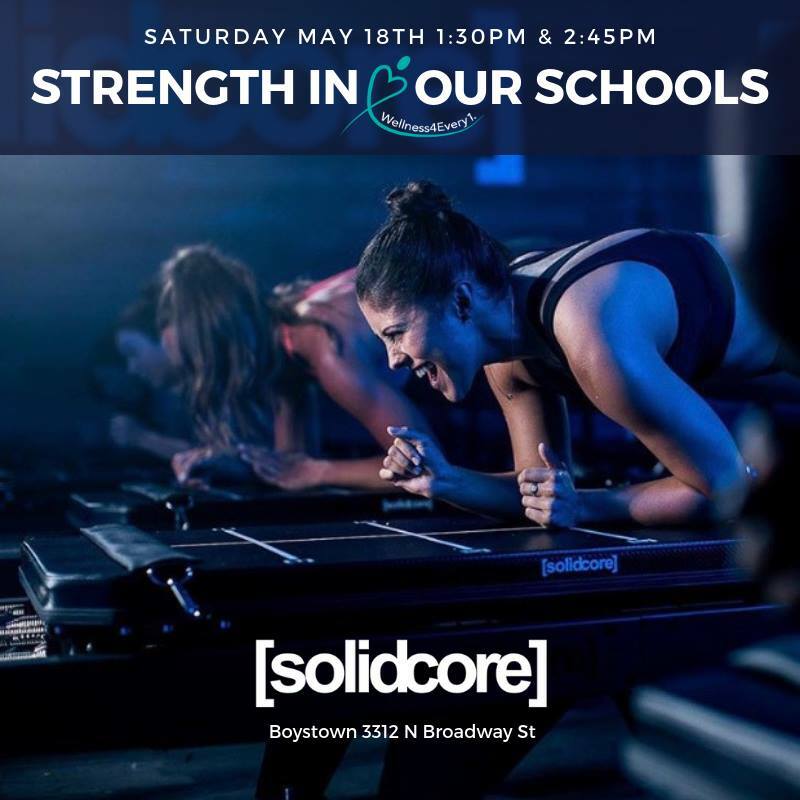 On Saturday, May 18th, Wellness4Every1® will be hosting Strength in our Schools at Solidcore Boystown to raise money for arts and wellness programming in Chicago Public Schools. The classes will be at 1:30pm and at 2:45pm. Your ticket includes a swag bag and a raffle prize (solidcore swag). Solidcore may resemble other Pilates classes, but we assure you, we are unlike any workout you’ve experienced before. Each move at Solidcore has the foundation of a plank, squat, or lunge, with a plethora of variations to help strengthen your entire body. There is a maximum of 15 machines in most studios, meaning each client will receive personalized attention and accountability from their coach throughout the class! Capacity is limited, so we highly recommend purchasing tickets in advance. If you're not available to attend, you can sponsor a student or teacher to take a class for you. 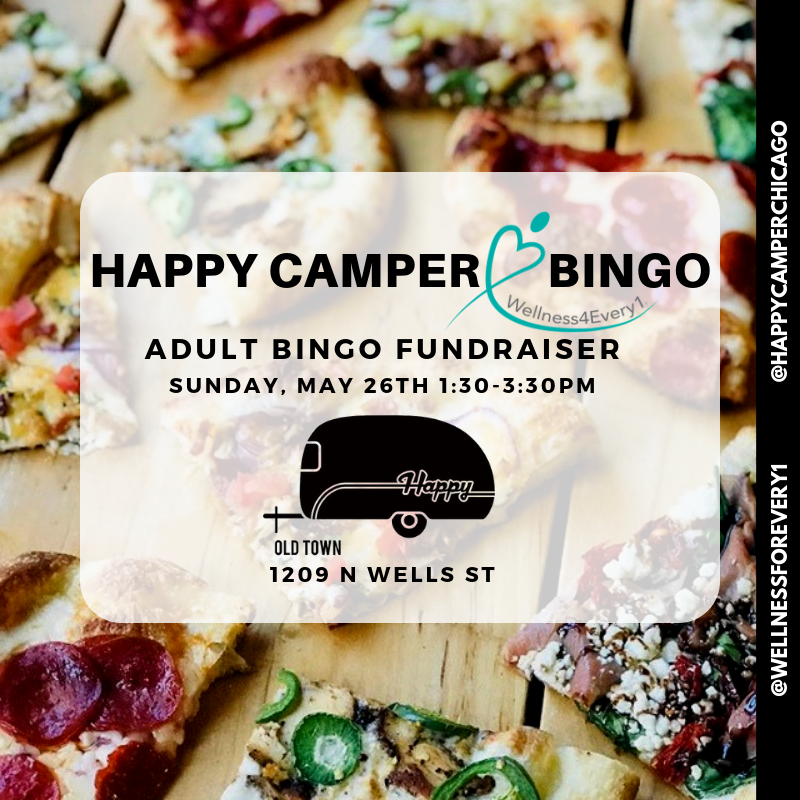 On Sunday, May 26th, Wellness4Every1® will be hosting an Adult Bingo Fundraiser at Happy Camper to raise money for arts and wellness programming in Chicago Public Schools. To play, there is a suggested $10 cash donation (there is an ATM on site). All donations will go directly towards Wellness4Every1 Chicago Public School programming. This is not a kid friendly event. We will have two long tables reserved. Everyone is welcome to come but encouraged to arrive early to reserve tables. Tables are provided on a 1st come 1st serve basis and since bingo is a very popular event at Happy Camper it is recommended to arrive before 12:00pm. 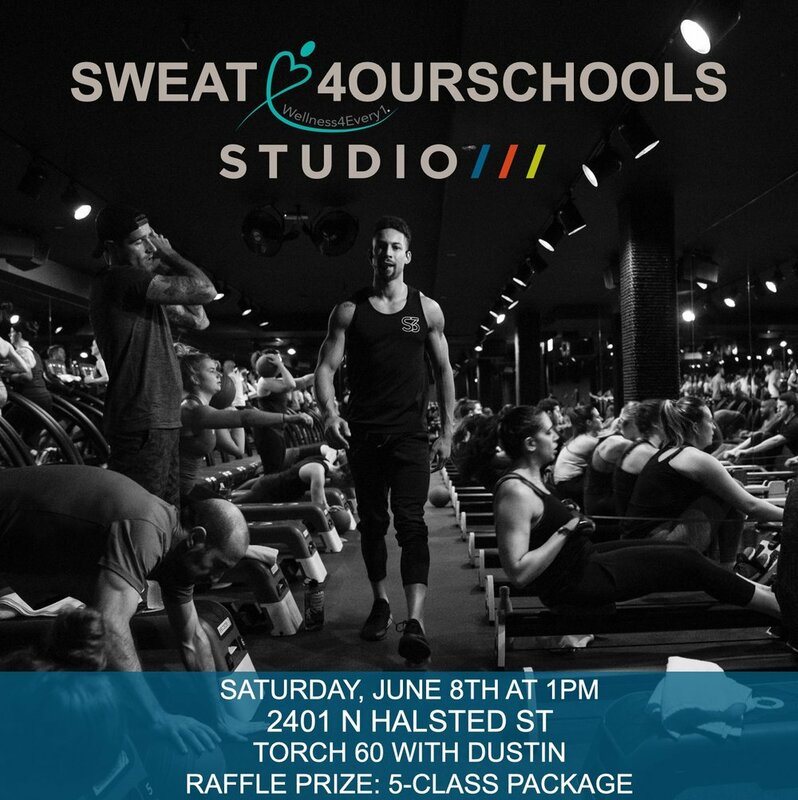 On Saturday, June 8th at 1pm Wellness4Every1® will be hosting #Sweat4ourSchools at Studio Three to raise money for arts and wellness programming in Chicago Public Schools. Your ticket includes this TORCH 60 class, a promo code for another class at Studio Three, a swag bag, and entry into our raffle. Two lucky winners will get a 5-class package to Studio Three. More about the class: When you enter the Interval Studio, prepare to train like an athlete. A group driven work out that produces proven results, Studio Three’s signature TORCH class creates the perfect combination of intensity and efficiency using bursts of explosive exercises paired with active recovery periods. This three-zone program delivers strength, power, and endurance all in one inclusive and immersive environment where you will continue burning calories post-workout. Our handpicked, expert instructors will motivate you while you work against the clock in intervals of running, lifting, and rowing that will boost your performance. Regardless of your fitness level, TORCH challenges you to explore and push your own boundaries and leaves you feeling accomplished and motivated. On Sunday, April 14th, Wellness4Every1® will be hosting #Sweat4ourSchools at SWEAT Gold Coast to raise money for arts and wellness programming in Chicago Public Schools. The class will be at 1pm. Your ticket includes a swag bag and a raffle ticket. More about the class: THIS IS WHERE CHANGE BEGINS AND CONTINUES. Step into a new you. Commit to transforming your body on the inside just as much as the outside. Take our challenging classes to head on to gain confidence, tone and define your body, and most of all, leave inspired to tackle any day. On Sunday, March 24th, Wellness4Every1® will be hosting a yoga and shop event at Outdoor Voices to raise money for arts and wellness programming in Chicago Public Schools. Join us for yoga with Molly Black and stay for a private shopping event. Enjoy an energizing yoga flow class with a cool-down meditation from 9:30-10:30 am followed by a private shop event at Outdoor Voices from 10:30-11:00am. Outdoor Voices makes activewear for #DoingThings daily - dog walks, runs, and yoga included. They believe in going out, moving our bodies, and having fun. Let's let go of our expectations, rules, shoulds and should not. Let's have fun, be free, make discoveries, make friends, and make progress. Molly Black created Wellness With Molly, a holistic platform for people to feel empowered through mindfulness. As a yoga and meditation teacher, she's passionate about elevating others to their fullest potential. Molly hosts workshops around the city focused on corporate wellness, stress/anxiety management, and body positivity. Overall, she loves partnering with people to improve their self-image from the inside out and help them design their lives for true success. Capacity is limited, so we highly recommend purchasing tickets in advance. If you're not available to attend, you can sponsor a student or teacher to take class for you. On Saturday, March 9th, Wellness4Every1® will be hosting a workout class at Barry's Bootcamp to raise money for arts and wellness programming in Chicago Public Schools. The class will start at 2:15pm. Ticket price includes your class, swag bag, 1 raffle ticket, and a salad from Gotham Greens. Swag bag includes: Quevos, Bulletproof, Nutpods, Primal Kitchen, Banza, Bloom Daily Planners, and Graze. Raffle prizes include 2 certificates to VIVE! 2 winners will each get to select a service of their choice! AND 2 one-year memberships to THRIVE! More about the class: Barry’s is the original high-intensity work out. It burns up to 1,000 calories in one class (!!! ), tones muscle, maximizes fat loss, and increase your metabolism, so you actually burn calories even after class is over. We’ve got the science to prove it! 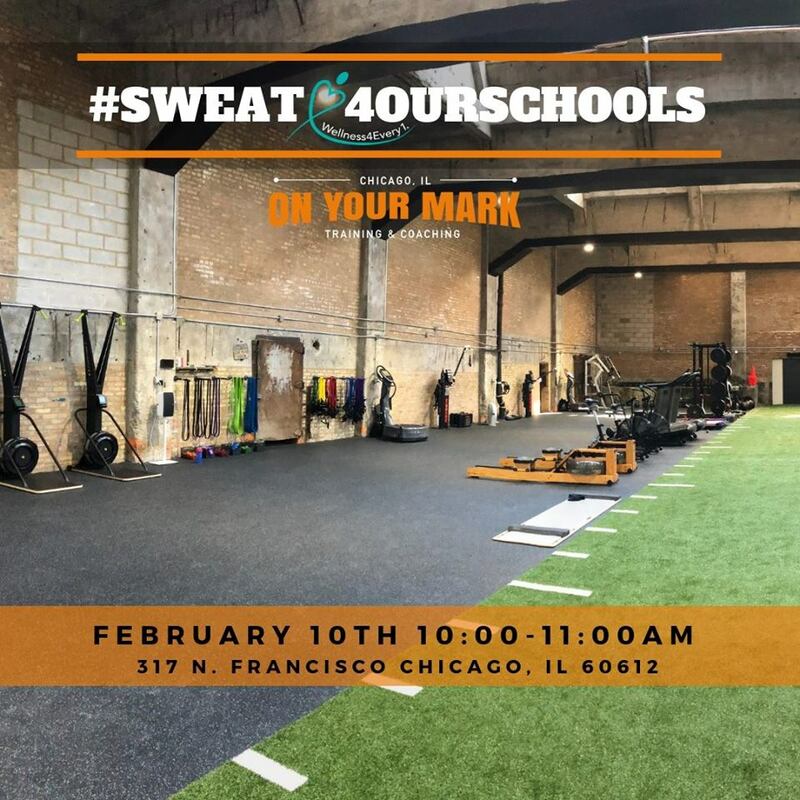 On Sunday, February 10th, Wellness4Every1® will be hosting a #Sweat4ourSchools class at On Your Mark to raise money for arts and wellness programming in Chicago Public Schools. The class will be at 10:00 am. Ticket price includes your class, swag bag, and 1 raffle ticket. More about the class: On Your Mark Coaching + Training is for endurance athletes who want the UNDIVIDED ATTENTION of a coach and trainer who will help them succeed. Owned by Emily Hutchins (Nike Master Trainer), OYM has a diverse training philosophy, focusing on athletic performance, lifestyle, and personal training. OYM coaching, personal training, corrective analysis and nutritional consultation are the building blocks for creating a better you - using only the best and most state of the art training equipment in the industry and providing professional expertise in developing the best formula to suit any client’s needs. Emily started teaching small group class formats in order to bring a personal training environment to a group fitness atmosphere. Her desire and passion is for individuals to get the attention they deserve within the positive camaraderie of a group. On Sunday, January 13th, Wellness4Every1® will be hosting a yoga class at The Space Between to raise money for arts and wellness programming in Chicago Public Schools. The class will be from 12:00-1:00pm. More about the class: Get rooted in your practice, building from the foundation up. Whether you’re just stepping into your yoga journey or you’re an experienced yogi looking to build a stronger foundation for your practice, Rooted is the perfect class for you. Get a better understanding of poses and their purpose, optimal and safe body alignment, how to link breath to movement, and the beautiful principles and history of yoga. But don’t be fooled, this class is not ‘easy’ and will challenge you in every way. Class is unheated. On Saturday, December 15th, Wellness4Every1® will be hosting 2 Surf Barre Pilates classes at Hang 5 Fitness to raise money for arts and wellness programming in Chicago Public Schools. The classes will be from 10:00-11:00am & 1:00-2:00pm. Your ticket includes a swag bag (Rhythm Superfoods, Goodwipes, Navitas Organics, RXBAR, and Protein Bar & Kitchen) and a raffle ticket. Raffle prizes include: 3 pairs of Surf Leggings (winner may choose the size). More about the class: Surf Barre Pilates are taken to the next level without a reformer. You'll feel the burn in muscles you know and discover it in ones you didn't know you had. This Barre Pilates class incorporates the Surfset boards to engage more of your core, a ballet barre for proper alignment and resistance bands to sculpt and challenge your body. As seen on CNN, these balance boards not only challenge your core, but work the small muscles for a more balanced, injury-free workout. On Sunday, November 18th, Wellness4Every1® will be hosting a cycle class at SALT Fitness Chicago to raise money for arts and wellness programming in Chicago Public Schools. The class will be from 12:00pm-1:00pm at the Wicker Park location. This motivational beat-driven cycle class taught by SALT's rockstar instructor will not only change your day, but your life. The inspiration you find while riding will help you achieve results like no other cycle class and give you more energy than you ever dreamed. Their instructor will help you build on your foundation and leave you feeling class awesome. Taught in a dark room with a lighted accent wall, this class moves you to the beat while pushing you to conquer the highest hills and the fastest speeds. You will not only build your strength, but you will work on cardio, flexibility, and core to help you become the best you. There will not be weights incorporated while riding. On Thursday, October 18th, Wellness4Every1® will be hosting a boxing class at Title Boxing Wicker Park to raise money for arts and wellness programming in Chicago Public Schools. The class will be from 7:00pm-8:30pm at the Wicker Park location. This class will have you experience boxing like you never have before! This high-intensity workout will sculpt your body and help you burn calories. Expect to learn how to deliver the best jab, cross, hook and uppercut combinations to a 100 pound bag. This training will have you feeling confident and exhilarated by the end of your class! 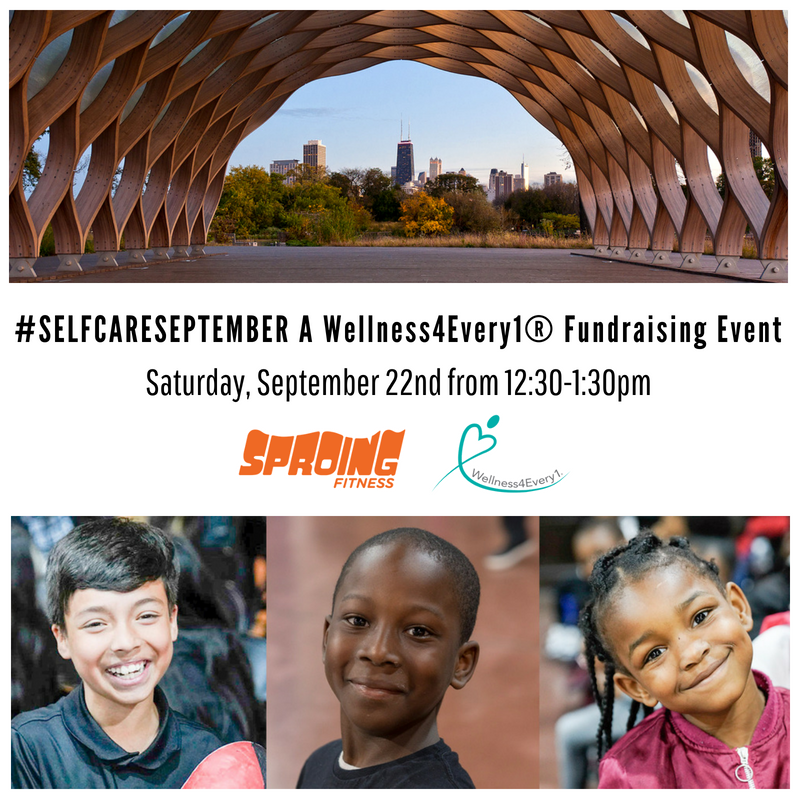 On Saturday, September 22nd, Wellness4Every1® will be hosting a running-based HIIT class at Sproing Fitness to raise money for arts and wellness programming in Chicago Public Schools. The class will be from 12:30pm-1:30pm at the Lincoln Park location. This 45-minute class featuring 30 minutes of High Intensity Interval Training will have you experiencing HIIT like you never have before. These workouts feature intervals of high intensity cardiovascular exercise interspersed with strength and power exercises which creates maximum fat burning, muscle toning, and overall total body fitness in just a forty five minutes. People of all fitness levels and familiarity with high-intensity interval training are welcome to try this class! On Saturday, September 15th, Wellness for Everyone will be hosting a Total Body class at CrossTown Fitness Roscoe Village to raise money for arts and wellness programming in Chicago Public Schools. The class will be from 12:30pm-1:30pm at the Roscoe Village location. This Total Body workout will get you up and moving and work muscles you didn't even realize you had. While every class is unique to the instructor, these classes are designed to include interval cardiovascular routines, and mobility and strength training. People of all fitness levels and familiarity with interval training are welcome to try this class! Ticket price includes 1 raffle ticket. The winner will receive an unlimited 30-day pass to Crosstown Fitness! Wellness for Everyone is committed to providing arts education to Chicago Public School students, as well as a space for physical and emotional well-being. Many of our students have enormous stresses in their everyday lives. They live in areas riddled with crime and violence. Their only meals come when they are at school. They lack exercise opportunities and outlets for creativity and energy. Often the schools we serve don't have space for exercise. They don't have gyms or auditoriums and its too dangerous for the students to play outside. These classes give students an hour per week of escape from these stresses, as well as access to arts educations which there is no longer funding to support. On Saturday, September 8th, Wellness4Every1® will be hosting a Climber Core class at Brooklyn Boulders West Loop to raise money for arts and wellness programming in Chicago Public Schools. The class will be from 12:30pm-1:30pm at the West Loop location. This mat-based class - geared specifically to the needs of a climber and anyone else looking to develop a monster core - strengthens your abs and back muscles for improved posture and performance (on and off the wall). Climber Core integrates concepts from pilates, yoga, and climbing into a circuit training program designed to help you build core endurance, stay healthy, and climb stronger. All fitness levels are welcome. 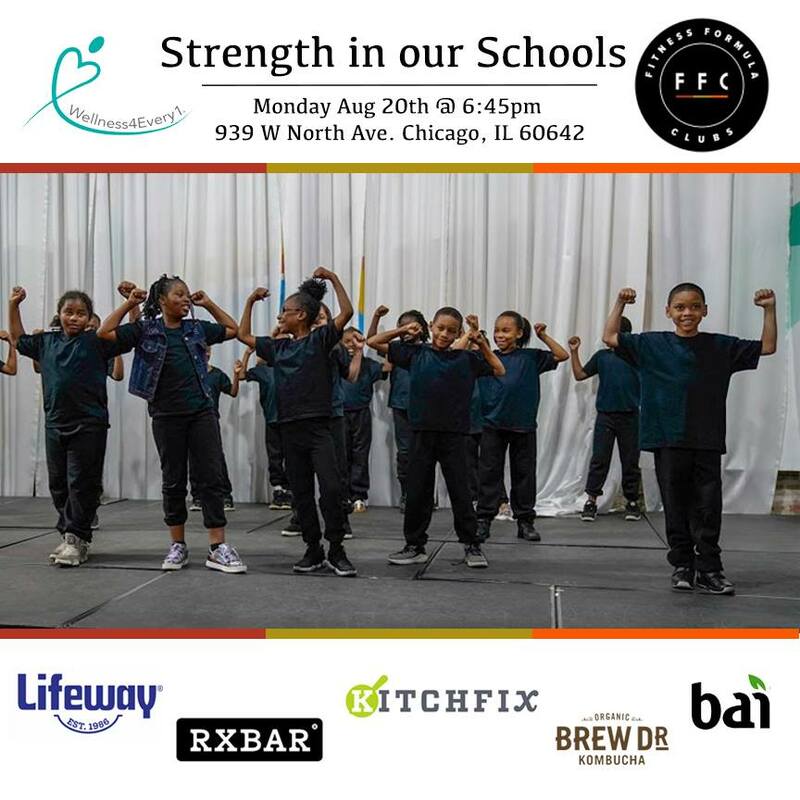 On Monday, August 20th, Wellness for Everyone will be hosting a chisel fitness class at FFC Lincoln Park to raise money for arts and wellness programming in Chicago Public Schools. Chisel is a fast-paced, non-stop workout class involving weights and high repetitions meant to reshape your body. The class will take place at the FFC Lincoln Park location from 6:45-7:45pm. Ticket price includes 1 raffle ticket. Two winners will receive a 30 Day Guest Membership that includes three training sessions! On Sunday, July 15th, Wellness for Everyone will be hosting a morning yoga class for kids and their families with Athleta Fremont to raise money for arts and wellness programming in Chicago Public Schools. We'll enjoy a family yoga class from 9:30-10:30am. Afterwards, we will have a private shopping event at Athleta, where 10% of the profits will go directly to our Chicago Public Schools arts and wellness program! Ticket price includes 1 raffle ticket. The lucky winner will get a $100 gift card to shop at Athleta! 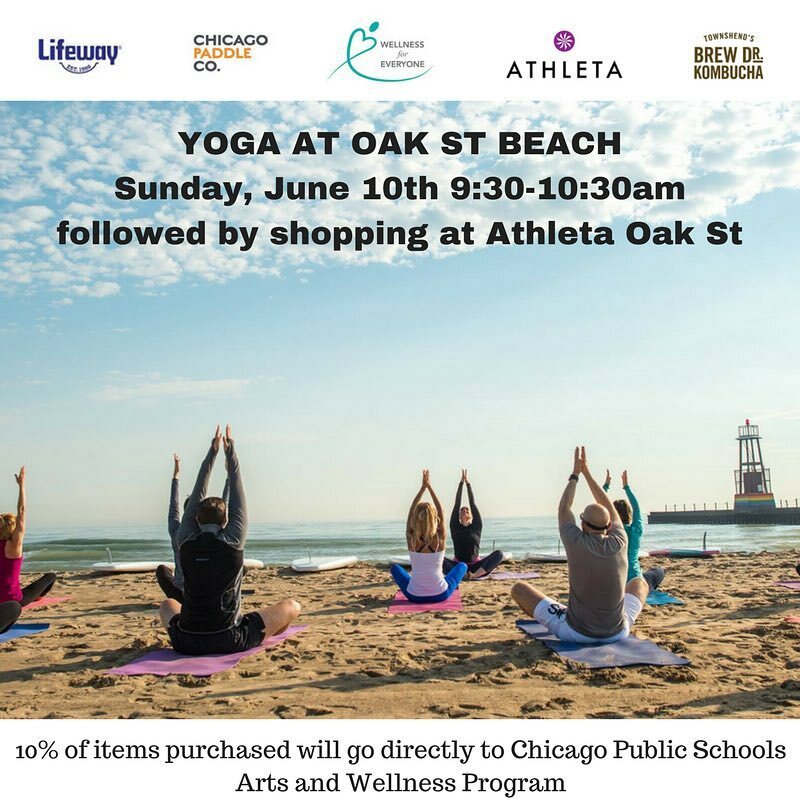 On Sunday, June 10th, Wellness for Everyone will be hosting morning beach yoga with Chicago Paddle Company at their new Oak St Beach location to raise money for arts and wellness programming in Chicago Public Schools. We'll enjoy a morning yoga class on the beach from 9:30-10:30am while getting to see where Chicago Paddle Company will be holding lessons and events starting this summer! Afterwards, we'll head together to the Athleta on Oak St for a private shopping event, where 10% of the profits will go directly to our Chicago Public Schools arts and wellness program! Get Down, Dog & Donate! On Sunday, May 20th Wellness for Everyone will be hosting a Vinyasa 60 class at Yoga Six in Lincoln Park to raise money for arts and wellness programming in Chicago Public Schools. Vinyasa 60 will give you the opportunity to dive deeper into your yoga practice! The Y6 Vinyasa classes connect movement to breath while working towards more challenging postures. You can develop strength, flexibility and stamina as you challenge your body and mind. The instructor will skillfully guide the class towards a specific posture, theme or focus, all while incorporating in breath work (pranayama) and yogic philosophy. Sara Nash, your instructor for the Vinayasa 60 class, began teaching yoga in 2009 when she started a yoga program at Kenyon College. From there she continued her love of all things yoga back in Chicago. A born and raised Chicagoan, Sara received her 200hr certification in 2011 and has been teaching in Chicago ever since. Sara is the Regional Manager for the Yoga Six Chicago and Milwaukee regions. We are excited to flow with her! Your support makes Wellness4Every1® possible!